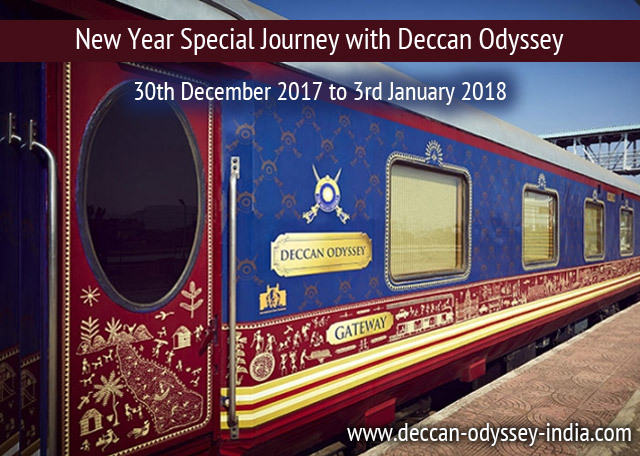 Celebrating the beginning of the New Year 2018, Deccan Odyssey, the Indian luxury train has come up with a new itinerary. The 5-day “SUSEGADO GOA” journey has been specially crafted to make the New Year, from the 30th December 2017 to 3rd January 2018 an unforgettable holiday. Guest will not only have a gala a time aboard the luxury train but also enjoy the pleasures of Goa, one of the most happening places in India. Welcome this New Year in style and luxury with Deccan Odyssey. The phrase ‘Susegado’ perfectly depicts the way of life in Goa. The Portuguese phrase means to take it easy and enjoy life to the full and what better than this for starting a new year. The word concludes the perfect rule of thumb to adopt during a Goa holiday. With the new train tour, get ready to enjoy on the beautiful beaches of Goa. The golden sands tickling your toes, waves washing your feet, sea breeze soothing your skin and blues that make you excited. Marvel at the Portuguese legacy, the elegant architectures and revered Old Goa churches. Savor the mouthwatering Goan cuisine with Feni, the delicious local brew of cashews. Drop out shopping, there are some incredible bargains. The highlights of the celebratory Deccan Odyssey New Year journey includes scenic journey through the beautiful Konkan region, traditional welcome on-board, New Year Gala Dinner, sumptuous meals on-board the train and at special venues, free flow of IMFL on-board during the journey and flexi tour with multiple optional programs. Get to enjoy a fun time in Goa aboard one of the finest luxury trains indulging in comforts of a spa, lounge and dining halls. The Indian luxury train Deccan Odyssey is a joint initiative between The Ministry of Railways, Government of India & State Government of Maharashtra. Awarded with the World Luxury Award for seven times, Deccan Odyssey is one of the popular luxury trains in India. The scenic rail journey is designed to offer the best of heritage, culture and natural bounties of India. The interiors of this luxury train are fusion of the state-of-the-art amenities of the modern days and the opulence of the past. The décor reflects art and tradition of the Deccan region. The cabins are housed with modern amenities such as LCD television, Wi-Fi internet, individual climate control, etc. the train has further facilities of a personal attendant, fitness center, spa saloon, dining cars, bar & lounges and even a conference room. I understand that the package is offered to Indian Nationals . Please let me mnow the tarriffs .